This recipe / idea has been brewing in my head for months. Ever since we bought some frozen burritos from CostCo, I thought “hey, I could do that.” So, I did! You can make these however you’d like, I just used these 3 things because they’re simple and yummy. But you could do cooked rice, salsa, beef, pork, whatever! I like to make foods one day in bulk and then it lasts us for a while. These will be for me for lunch during the week while at home because you can only eat so many sandwiches and I am not a fan of leftovers. 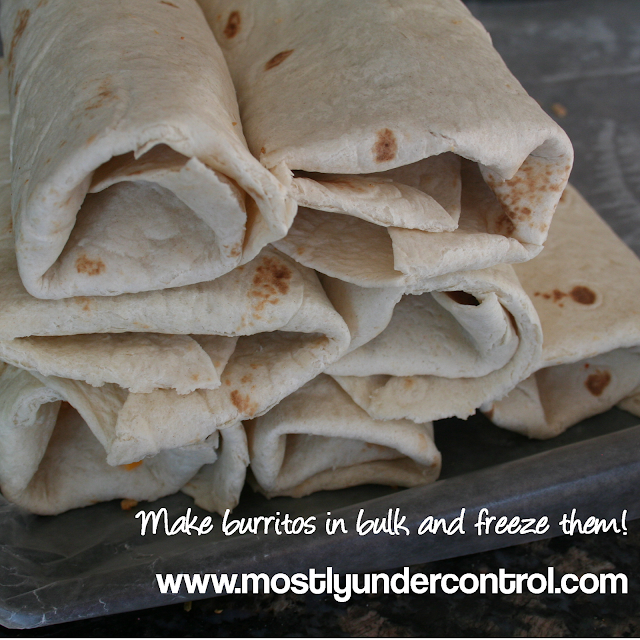 A tip for you – when rolling your burritos, zap them in the microwave while wrapped in a damp paper towel. It makes a HUGE difference. In true Melanie fashion, I discovered this when I had already done half of them. Also, I put my filling in favoring one side instead of in the middle. I felt it was easier to roll it tight that way. Again, found this out when I had about 2 burritos left. *Umm, make burritos 😉 I layered beans, chicken, cheese. When I got to the end, I ran out of chicken so I did a few with just beans and cheese. Which is fine by me! And I’m the only one that’s going to be eating them. *Bake at 350 for 10 minutes if it’s thawed, or 25-30 minutes frozen. Next time I will try other stuff inside of them!